The prisoners of the SS special camp/KZ Hinzert were required to perform physically demanding and dangerous work. Most of the prisoners were assigned, for example, to clearing work in the surrounding forests, which had to be carried out with totally inadequate tools in so-called external commandos (Außenkommandos). Often quarry, earthworks and drainage work was being undertaken. Looking at the sub-camp detachments in Trier, Gusterrath (company Romika), Hermeskeil, Pölt and in other places, a system of self-sufficient camps were formed with their own accommodation for prisoners to concentrate the workforce directly at the locations without a long journey from mid-1944. The importance of Hinzert concentration camp within the system of exploitation of the SS under the direction of the WVHA becomes more evident. 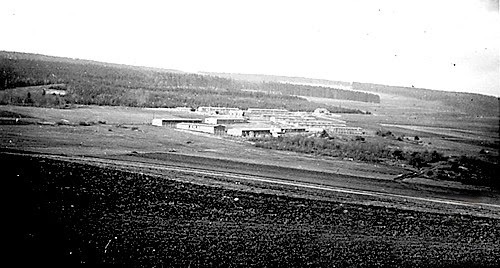 As in the early days of the camp a network of police detention centres [they held prisoners] with considerable distance from the main camp, of which the central camp Wittlich lasted the longest time until February 1942, now Hinzert was again the organizational centre for a new network of camps, formed only for war economic reasons. The total death toll of Hinzert concentration camp can not be determined exactly. According to the research of the 'Conseil National de la Resistance', they established a death toll of 321. In this figure the victims of mass killings are included. The French military administration estimated the number of concentration camp deaths in 1946 to about 1,000 men. Often the bodies buried in shallow graves in the woods were sprinkled with chloride of lime to accelerate decomposition and were never found. According to the accounts of former prisoners one must assume that the actual death toll was higher than this number of actual deaths accounted for and exhumed after the war. 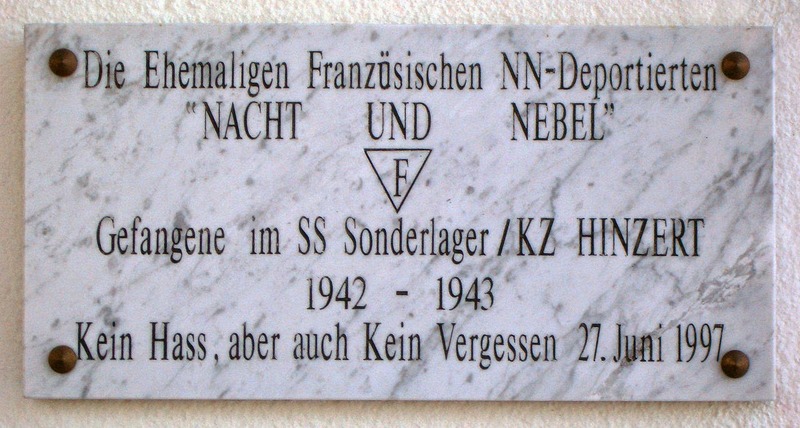 217 victims of the SS-Sonderlager HInzert that could not be transferred to their home countries were, at the instigation of the French military administration in 1946 buried at the "Cimetière d'Honneur" (Honorary Cemetery), which characterizes the memorial today. The documentation and meeting house in front of the cemetery, the so-called ”cemetery of honour” was established in 1946 by the French military administration on the grounds of the former guard accommodation. 217 people are buried here who could not be repatriated to their home countries after the war. It became more and more the beginning of the memorial. Georg Baldy and later his son, Bernhard Baldy, have been taking care of the graves since 1958. Many of the meanwhile deceased survivors of the concentration camp from different countries contacted them whenever they returned to the place of their imprisonment to pay their tributes to their murdered comrades. Until the 1990s, the grounds of the cemetery had a shadowy existence. The character of the furtive place was reinforced by the name ”cemetery of honour“ which was used until 1994 and actually covered up the background of the concentration camp. An open air information tableau in four languages which was installed at the south-east corner of the cemetery in 1997 briefly explains the historical background of the grounds. 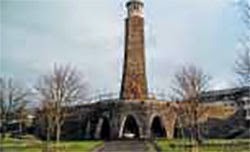 On the initiative of the Federal State Central Authority for Political Education and the Development Association of the Documentation and Meeting House from the former Concentration Camp at Hinzert, the Rhineland-Palatinate State Government together with support from all four parliamentary parties, decided in favour of a memorial. 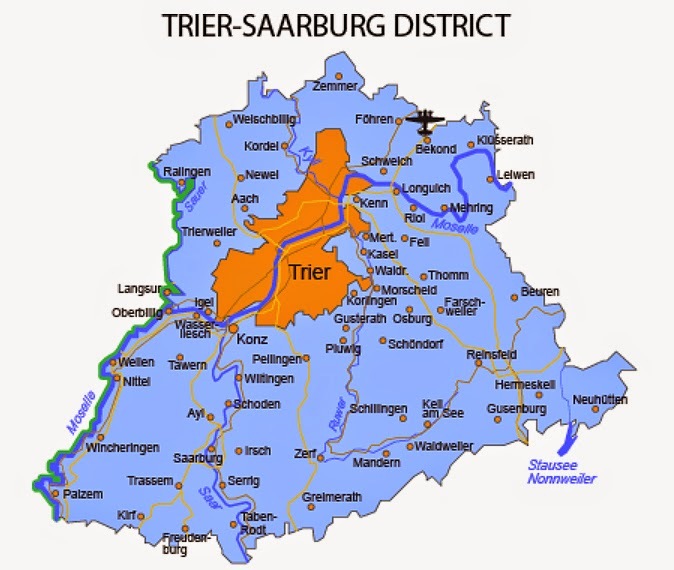 Through increased air raid attacks at the beginning of 1945, the transport infrastructure collapsed largely in the Trier area at the end of February all together. The Reichsbahn (railway) line Trier-Hermeskeil was interrupted by the bombing of a bridge at Waldrach. The use of external commandos of camp inmates had to be restricted more and more. On November 21, 1944, the Hinzert concentration camp was formally subordinated to the Buchenwald concentration camp, but the enforcement was apparently not performed correctly. On the 17th of January 1945 camp commander Sporrenberg signed his last Hinzert documents. Sporrenberg was transferred to Buchenwald and got to oversee a satellite camp in Thuringia. Now only a provisional camp, it was taken over by a chief criminal inspector and Obersturmfuhrer from Trier. As the 3rd US Army had reached Trier, the SS special camp Hinzert (SS-Sonderlager) was officially closed on 2/3 March 1945. The prisoners were accompanied by some men of the SS guards, and hastily taken on an evacuation march with the aim to reach Buchenwald. The exhausted prisoners walked across the Hunsrückhöhenstrasse R-327, R-50 and R-9 to Mainz and then over the bridge across the Rhine into Hesse. Two carts with files and partially seated by SS personnel had to follow at the rear. Three prisoners who could not continue due to their exhaustion, were killed during the march by their captors. Some prisoners succeeded to escape in Hesse from the column, especially since gradually also guards made their own get-away. The US forces overtook the columns which were split into different groups and freed the prisoners at last at Giessen. In 1946 a US military court sentenced the former camp doctor Dr. Waldemar Wolter for his crimes he had committed during his tour of duty in Mauthausen concentration camp, to death, he was hanged in 1947 at Landsberg am Lech. In 1947, the former Lagerkapo Eugen Wipf, who was a Swiss citizen, was arrested in Switzerland and received a life imprisonment after a trial of the federal circuit court in Zurich. Wipf died a few weeks after the pronouncement of judgement from a blood disorder. Hermann Pister was sentenced in Dachau by an American military tribunal during the Buchenwald Trial in 1947 to death. He died prior to execution in the US War Crime Prison at Landsberg am Lech. In June 1948, the [French] Tribunal General Government Militaire de la Francaise d'occupation zone en Allemagne en Autriche got established in the castle of Rastatt and indicted 15 former members of the SS, and in September 1948 another seven members from the SS-Sonderlager/KZ Hinzert. The Tribunal imposed in the first instance four death sentences against the defendants: Pammer, Reiss, Schattner and Fritz. Life imprisonment with hard labour was the verdict for the defendants Windisch and Heinrich. Five defendants were in terms of the indictment found not guilty, another was set free for lack of evidence, about the rest of them, the court imposed prison sentences for the others. After a subsequent revision process, the death sentences were reduced in part to life imprisonment. On 14 April, Georg Schaaf, called "Ivan the Terrible", and Joseph Brendel were sentenced by the Mannheim Regional Court to ten years, and two years and six months respectively. Brendel was in 1961 again before the court because the murder of Soviet prisoners of war had not been part during the first trial. The district court Trier considered him innocent on December 20, 1961 on the charges that he assisted in the murder of 70 Sowjet Prisoners of War in October 1941 at Hinzert. 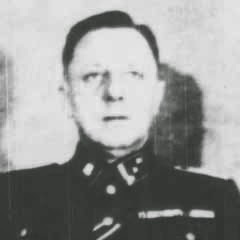 Egon Zill, second in command of the SS-Sonderlager Hinzert/KZ and later commander of Natzweiler-Struthof and Flossenbürg, was sentenced to life imprisonment by the Circuit Court of Munich in 1955. In 1961 he was set free. He died in Dachau in 1974. Celui qui se targue de répondre n'a, comme moi, pas connu cet enfer. Celui qui l'a vécu ne répond pas, parce qu'il ne peut répondre. Il tait son angoisse, il tait ses souffrances, il enfoui en lui toutes les cruautés subies. Et, si un jour il avait eu à choisir de donner son morceau de pain à son meilleur camarade en train de mourir pour qu'il vive un quart d'heure de plus, il ne vous le dira pas. Soyons humbles. Taisons-nous et n'oublions pas ! Let us be humble. Let us be silent and do not forget! Between September 1939 and March 1945 a total of at least 13,600 men were taken to the SS special camp. An accurate determination of the number of inmates of the camp is not possible. In the five and a half years of its existence Hinzert was a detention facility of prisoners from the German Reich, Poland, the Soviet Union, Luxembourg, France, Italy, Albania, the Netherlands, Belgian, Yugoslavia, Spain, Switzerland, Hungary, Czechoslovakia and the United Kingdom. Within the barracks a total of 560 beds were provided, but if simultaneously several major prisoner transports arrived in Hinzert as during the great waves of arrests in Luxembourg in November 1941 and Belgium, France and the Netherlands in 1942 a temporarily increase from 1.000 to 1.200 prisoners huddled into the barracks. In this revival over the initially facilities sufficient even by NS-standards of the barracks had not enough bunks, lockers, or still washing facilities available. On average, about 800 prisoners were normally in Camp Hinzert. As in all concentration camps Jewish prisoners, gypsies and deportees from Eastern Europe were often treated very badly and with unbridled brutality in Hinzert. So far, it can be assumed that about 100 prisoners in Hinzert were Jews and that they were not primarily there for racist reasons, but for political reasons, mostly from the Benelux countries. They were recognizable in the camp by the yellow 'Star of David'. About a third of the Jewish prisoners were murdered, beaten to death, scalded, starved or drowned. Proof of Roma prisoners have been limited to one case that has become known for the murder of a Roma boy by the Oberkapo Eugen Wipf. The 'prisoners' society' changed from year to year, depending on the political circumstances and the course of the war. 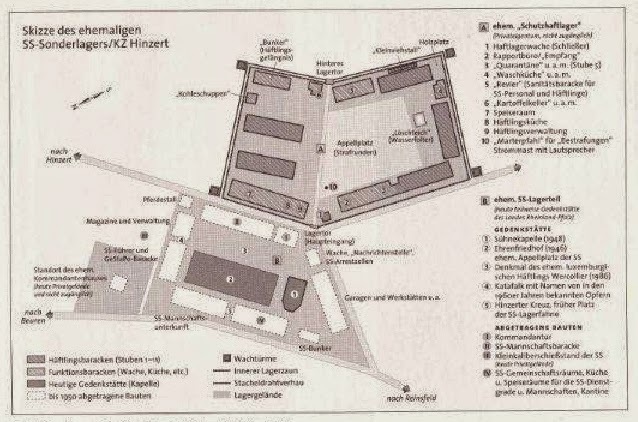 Shown in simplified form, the following groups of prisoners were noticeable in appearance: In the early days of the camp mostly Reichs-German labour reformatory detainees, police and custody-prisoners were brought to Hinzert. From 1941 regular transports of Luxembourger resistance fighters, who had set themselves up to defend against the use of their country, in particular the inclusion of the Grand-Duchy (Großherzugtums) into the Gau of 'Moselland' and against the forced recruitment into the German Army. Luxembourger interned in the camp had limited scope to receive mail from home, and with good behaviour were often released. As a result of the "Nacht und Nebel' decree from May 29, 1942, large transports of French prisoners arrived at the camp. These NN deportees were completely isolated from the outside world and were used in commandos in the context of specific camp-work. The holding of the group 'E-Poles' was due to the necessary 'probation' as a future German citizen and had only limited contact with another inmate group. They were used in enclosed commandos in part at given work details. One particular group of prisoners represented the former Foreign Legionnaires, as France surrendered and in pursuant to Article 19 of the ceasefire agreement of 1940, the German Reich demanded the return of them. 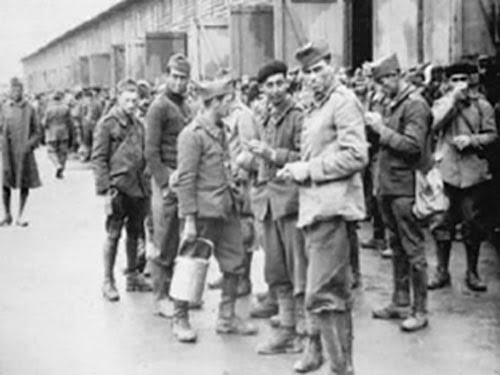 These former Foreign Legionnaires of German nationality were deported from the distribution/holding centres Frejus via Charlonsur-Saone to Hinzert. Between June 1941 and the end of 1942, more than 800 former members of the French Foreign Legion were imprisoned in Hinzert. Statements of Luxenbourg witnesses indicate that these foreign legionnaires were separated from the others and housed in their own barracks. They were checked for their loyalty towards Germany to fulfil duties with honours within the Wehrmacht and if found satisfactory incorporated into the armed forces, or transferred to other prisons, for example, the jails of Bruchsal or Krislau. The Legion’s toughness and ruthlessness are indisputable, but there is no reason to suppose that it has produced better warriors than those of other crack units. The mystery and diverse origins of its recruits do more than its battlefield prowess to create the ethos that catches the imagination of military romantics. There definitely were former members of the SS in the Foreign Legion, but a lot of it is based on exaggeration. 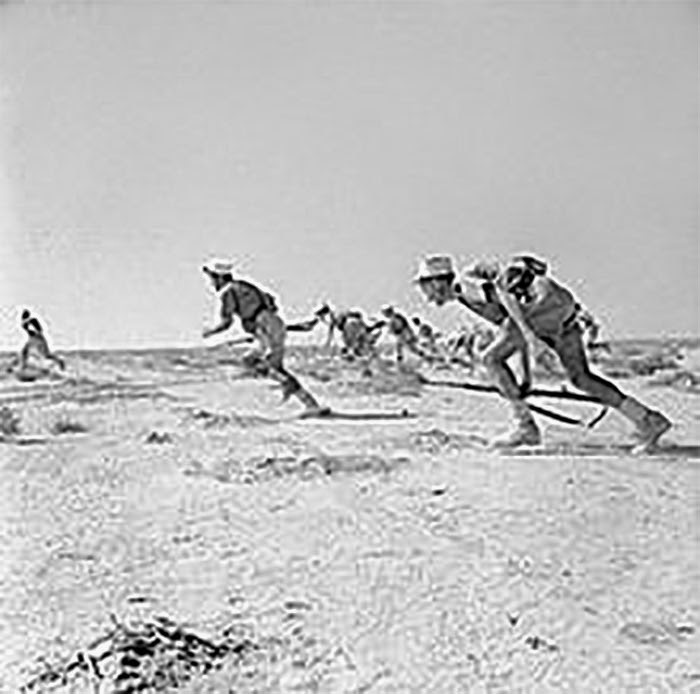 After the Second World War France lacked the will to keep fighting another war and was short on men: To recruit foreigners was an obvious choice, the first recruitments took place as early as 1944 when they recruited in North African prisoner camps, even though they only took Italians and Austrians. When the war had ended one year later they started recruiting on a wider base and then there indeed was a swap of former SS soldiers. However due to bad press and obviously because of the grudges held by the French towards the Germans and especially the SS they soon started sorting out SS soldiers (recognisable by blood group tattoos under the left armpit, even though many carved them off there, it still left a scar). Interesting fact: While they were relatively strict about German SS soldiers they didn't do background checks on other nationalities, so many SS members from Eastern Europe and even French collaborators managed to get into the Legion, often because they would have faced trials in their homelands.So its more correct to say: Yes, there were former members of the Waffen SS, but many of them weren't German, but in fact Polish or Russians. Another group of prisoners were the forced labourers from Western and Eastern Europe, which were brought for different reasons to Hinzert, to date only sporadic evidence is at present available on this subject. Detentions into Hinzert are known for trying to escape from work, lack of due zeal at assignments, absenteeism, or for illegal consumption of alcohol. If a forced labourer worked in agriculture, after his release from Hinzert, he would put into another type of profession or work detail. If his detention in the camp was due to his fault in an industrial plant, he had to return to the same job. The administration's point of view was: "With the temporary incarceration and subsequent assignment to the previous occupation it was intended that in such tenacious cases of absenteeism, such as it may be, an immediate exemplary punishment or transfer to a concentration camp will have the desired effect, and certainly have an educational attitude towards productiveness on the other workers. It spreads otherwise too fast around, the view that the authorities did not not crack down severely enough". The Belgian Francois D., who had to work at a company in Ludwigshafen, was not coming for work several times and was admitted in the summer of 1943 for eight weeks into the the SS special camp, then he had to go back to work for the same company. 'Historical road sign at the Hinzert concentration camp. The sign is presently part of the permanent exposition in the National Resistance Museum in Esch-sur-Alzette, Luxembourg'. On admission into the Labour Education Camp, eight weeks detention were common as a rule. Since the Hinzert concentration camp had not only the function of a work camp, an extension of the detention period could already be specified at the briefing. The young Petro D. from Ukraine was apprehended at the age of 16 from his home in the Ukraine and had to work in Euskirchen and later at the Ford plant in Cologne, had fled but was arrested by the Gestapo in Trier. Petro D. remained from 1943 until the dissolution of the camp in Hinzert and was liberated in 1945 on the evacuation march by American soldiers. The special camp was led successively by three commanders: first commandant was SS-Sturmbannführer Hermann Pister, who worked in Hinzert from the 9 October 1939 to 21 December 1941, before his move as commander in Buchenwald until in mid-April 1945. His successor at Hinzert was Sturmbannführer Egon Zell, but at the end of April 1942, he was first commander of the KZ Natzweiler and later at Flossenbiirg . Third camp commander was Hauptsturmführer Paul Sporrenberg from 23 April 1942 to January 1945. The commander was responsible next to the camp, also for the guards, slightly elevated and diagonally opposite the prisoner camp, a house was available for him. The commanders had complete disciplinary powers in a supervisory capacity over the the guards. The 'First protective custody camp' and the other 'protective custody sections' were responsible for the supervision of prisoners in the camp. The protective custody camp 'teacher'(Erzieher) or 'block leader' who had to supervise the inmates in their barracks and to ensure the implementation of the orders of the commander or protective SS camp leader. For the registration of incoming or Return-transports of prisoners, this came under the jurisdiction of 'the Rapportführer' ' . The prison records were maintained at headquarters. Of special brutality towards the prisoners were SS-men George Schaaf and Joseph Brendel. Georg Schaaf was called in the camp 'Ivan the Terrible'. He was enlisted into the guards of the police camp Hinzert since October 23, 1939. Former prisoners report that he participated in countless abuses towards prisoners . Josef Brendel, by profession a mason, conducted duties from October 1939 in the infirmary. He tortured the prisoners by arbitrary decision, made surgery trials without anaesthesia and abused seriously ill prisoners with kicks and punches and often refused any medical care. A special role played In January 1942, Eugen Wipf, he was, in the autumn of 1943, promoted by the Camp-Administration and served as 'room elder' until June 6, 1944 as 'Lagerkapo' and thus had an overseer function of its prisoners. He spread fear and terror by its brutality and killed several prisoners. In the summer of 1941, Eugen Wipf originally from Switzerland, who after he had been sentenced several times in a [German] criminal court, had been admitted as an 'undesirable Alien and 'Antisocial' into the SS-Sonderlager. Numerous reports of former prisoners who had served their time in Hinzert and were then transferred into other concentration camps or detention centres, testify that in that tight little camp it was not even temporarily possible to hide from arbitrary action by the SS tormentors. Shortly after the war, he was arrested while crossing the border into Switzerland in May 1945 and later imprisoned. Responsible for several murders and acts of violence against detainees, he was by a Zurich Circuit Court on 6 July 1948 convicted to life imprisonment. Wipf died shortly after the verdict in the University Hospital of Zurich . The cause of death was a blood disease. The prison camp was surrounded with a 3.50 meter high fence of chain-linked wire mesh, barbed wire was attached at the top of this. 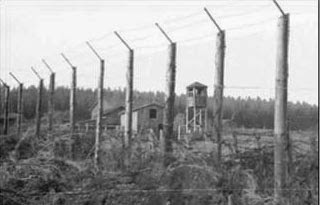 Against this high fence at a distance of about 1 meters away from from it, coiled barbed wires had been placed, to prevent prisoners from creeping under the high fence during an escape attempt.. At the four outer corners of the trapezoidal camp were four watchtowers. In the prison barracks, the 'bunker', were about 21 barred cells along a lined up central aisle. Barred cell window let in skylight. In addition, there was a dark cell in which the bunker overseer frequently committed abuses towards the occupants. 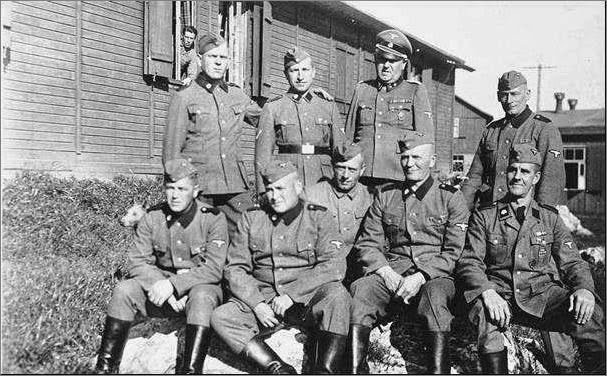 The SS officers, NCOs and men were transferred dated back to July 1, 1940 and incorporated into SS Death's Head units (SS-Totenkopfverbände) of the Waffen-SS. 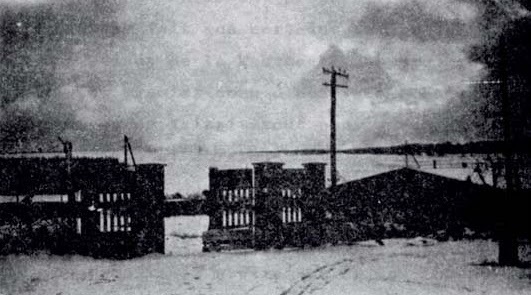 The man-power allowance for this special camp of December 12, 1940 which should have been an authorized strength of a total of 304 SS guards, could never be filled. In fact, only 192 personnel were at that time considered as active. The staff strength had dropped to 106 by the 10 June 1941. By January 15, 1943 there was a slight increase and amounted to 118, up to July 15, 1944 very little had altered with 117 people. The guard company, which originally consisted of three Units rapidly dwindled by year's end 1943-44 down to only two, resulting in a 24-hour guard shift. Thus, the free shift could be used for part of daily service tasks. This in turn led to disciplinary actions, arguments in a competitive sense evolved , rivalries occurred, holiday overruns was the norm, they overstayed their home leave, and staff was effected by the increasing consumption of alcohol. Some prisoners were constantly in contact with SS guards almost side by side within the camp, especially in the Clothing Unit, Drying Room and Showers, where, for example, Scharführer Johann Schattner the newly arriving deportees plagued with his sadistic behaviour, and in the 'infirmary' where Untersturmführer Schneider used to say: 'Here we have only healthy or dead, you have the choice'. As of spring 1943, a special department the 'SS dog unit' (SS-Hundestaffel) was used at Hinzert, which reported directly to the camp commandant Sporrenberg, and was assigned to the SS special camp (SS-Sonderlager) from Oranienburg and the Central Dog School of the SS there, after a representative of the RFSS for the 'Dog Department' (Hundewesen)' had inspected the camp between February 22 and March 1, 1943. The task of the trained dogs were primarily to roam at night between the inner and outer high camp fence to prevent escapes of prisoners or to follow the trail of a fugitive picking up the scent. Dogs were placed in the camp onto prisoners as well, to drive prisoners faster to a running stage or to attack them intentionally. A security measure and intimidation was that the prisoners after their arrival during hair cuts had an approximately three centimetre wide strip from the forehead down to the neck shorn twice, and was regularly re-cut to leave a bare strip. The prisoners called this strip the 'Autobahn'. It probably served the fact that the guards could easier identify escaping prisoners. (Ref. : Testimony of Dr. Claude Meyroune and Michel Goltais, former deportees at Hinzert on 16/03/1996 in Paris, in: NS-Documentation Centre Rhineland-Palatinate in Osthofen). The Army commander in chief, Field Marshal Walter von Brauchitsch, was highly sceptical of the order's legality. Brauchitsch issued a written order providing that discipline was to be maintained as it had been in the past. The entire Wehrmacht leadership were deeply corrupt men who all received enormous bribes from a secret slush fund known as Konto 5 run by Hans Lammers in exchange for loyalty to the National Socialist state. Brauchitsch received a monthly bribe of 4, 000 Reichmarks, which he greatly valued, and as a result was extremely loyal to Hitler because of his greed. In February 1940, Brauchitsch had brushed aside complaints from the retired Field Marshal August von Mackensen [who had British ancestors] that German forces had committed all sorts of war crimes in Poland in 1939 and were still committing war crimes on the grounds that he cared more about the money that he received from Hitler than he did about the lives of Poles. Given this history, Brauchitsch had no hesitations about enforcing the Commissar Order because his greed overwhelmed his scruples about enforcing an illegal order. 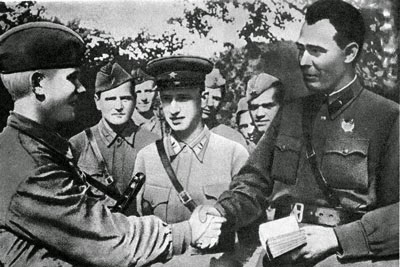 During the campaign against the Soviet Union, all the senior German officers enforced the Commissar Order despite its manifestly illegal nature out of the fear if they did not, Hitler would cut them from their monthly bribes of 4, 000 Reichmarks from Konto 5 which they cared about so much. Von Brauchitsch with Hitler. Brauchitsch was sceptical about the legality of Hitler's Commissar Order. Due to the forced recruitment of young Luxembourger, the resistance of various groups in the occupied Grand Duchy increased in the subsequent years. Mostly it was resistance in the form of assistance during escapes, providing of hiding places and intelligence work was done. Early in 1944 an attempted deterrent action to intimidate the Luxembourger Resistance was contemplated by the German occupier. 350 Luxembourger resistance fighters were brought to Hinzert at the end of January 1944. Originally it was planned to have 50 of them sentenced to death by a special court. 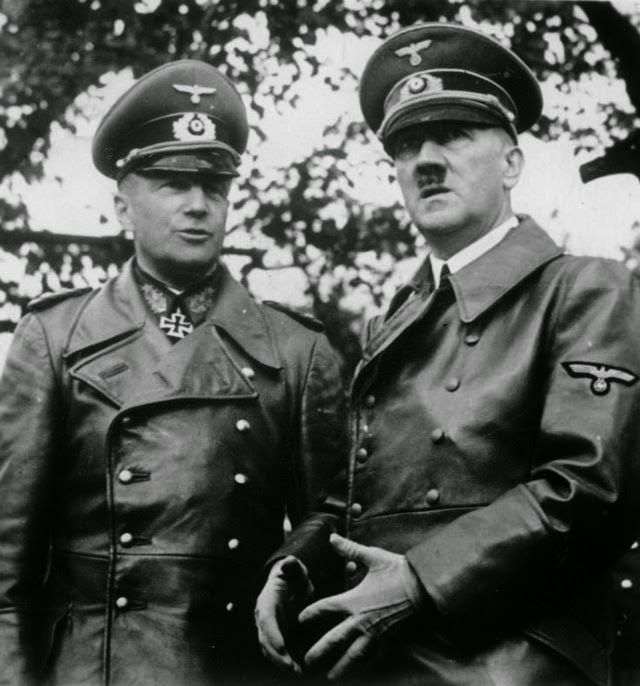 Gauleiter Simon and the Inspector of the Sipo and SD Wiesbaden, SS Standartneführer Otto Somann, agreed instead of a process with 50 death sentences to settle the matter on 'Police 'Security Policy' and to reduce the number to be shot to 25, because both expected an unfavourable political reaction with regard to the proposed Eindeutschung (Germanization) of the Luxembourger population. February 25, 1944, was the deadline date: 25 should be shot without trial in Hinzert. Two inmates escaped execution because they had previously been transferred to other camps and could not be brought back in time for the execution. Two other prisoners who were being treated for diphtheria and a stomach ailment in the hospital at Hermeskeil were collected as planned, however, and shot. So, finally 23 Luxembourger were executed in the forest near Hinzert and buried in a mass grave. The conformist newspaper 'Luxenburger Wort' wrote of a martial law enforcement in order to hide from the public that the resistance fighters were killed without due process. The 22-46 year old victims came from different parts of the country, it was intended that the the terror would spread over the whole Duchy. He was arrested in Münchengladbach in 1959 and accused of 60 cases of personal injury and deaths, and the execution of 23 Luxembourgers. He died before the opening of the proceedings. Many monuments in Luxembourg are dedicated to the occupation and liberation of Luxembourg. 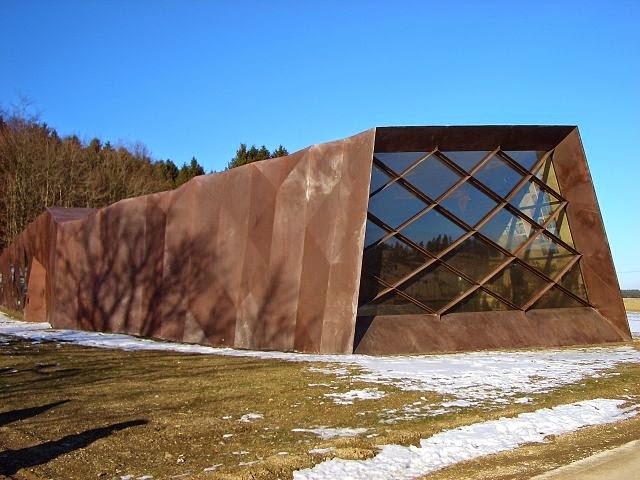 They remember the victims of the forced labour camps and the forced conscripts, the forced deportations and resettlements as well as the Luxembourg Jews dragged off to unknown destinations and killed. Many memorials commemorate the battles during the winter of 1944/45 and the American liberators. Instead of calling prisoner by their name as soon as they entered Hinzert [and elsewhere, this was standard procedure] they were addressed by their Number. Foreign prisoners who initially did not understand or pronounced their number in their own tongue were brutally beaten and punished. Here the Luxembourger prisoners played a special role, as they mostly grew up bilingual, they could at least help the French prisoners. They translated the orders of the SS-men or practised with the French, so that they could memorize their prison number in the German language and they could pronounce it properly when reporting. So they kept the prisoners that did not speak German often from further beatings or ill-treatment by overseers, which in some cases were foreigner themselves. Through letters, characters, or the Star of David on the handed out tattered, mismatched clothes, the prisoners were classified into different groups and thus made directly visible to the guards. Particularly characteristic of the this SS special camp/concentration camp, according to many former deportees that it was a 'run camp',(Lauflager) were everything had to be performed and settled on the run. In particular, for malnourished, sick and elderly prisoners continuous running coercion was painful and led to health problems. The food was totally inadequate. The French 'Nacht und Nebel'-deportee Dr. Claude Meyroune outlined after the war the situation: ''A very small ration of protein, almost without fat, no raw food in the form of fruit, very little vitamins and almost no calcium. A ration under 800 calories, is a starvation rations, on top of this, the worse forced hard working conditions". The daily rations consisted mostly of 300 to 500 grams of bread, an average of half a litre of tea or coffee substitute in the morning and evening and at noon a low-fat watery soup, containing mostly cabbage. The lack of of carbohydrates, fat, and protein resulted in prisoners loosing massive weight losses. Some lost in the first two months of their stay in Hinzert over 25 kg of their regular weight. After the war, he was indicted together with 60 other representatives of the Camp Administration in the Mauthausen-Gusen trials. Among other things, he was accused of having ordered the gassing of 1400-2700 prisoners shortly before the war ended. The assessment of his behaviour as medical officer in Mauthausen proved to be controversial. There were a number of former prisoners who attested of his decent behaviour. Thus, it was stated Wolter had sought to improve the medical care of inmates and fought for a better food supply in the camp. Still, he was convicted as a war criminal and executed at Landsberg on 28 May 1947. At the end of February 1945, Hackethal lived in his holiday cottage near Fulda. There he was arrested by American soldiers on April 16, 1945. In 1947, he was extradited to the French occupation zone. On October 28, he was sentenced to seven years in prison at Rastatt, on appeal on May 25, 1949, the sentence was increased to 15 years, rather than reduced. Subsequently, several appeals for Hackethal who was detained in the prison of Wittlich had been filed. Both, the Trier Bishop Bernhard Stein and Rhineland-Palatinate's Prime Minister Peter Altmaier campaigned for him. In April 1952 Hackethal was released and his financial benefits under the Act of Returnees were granted. He returned to Hermeskeil and practised there until his death as a doctor. He was married and had eight children. 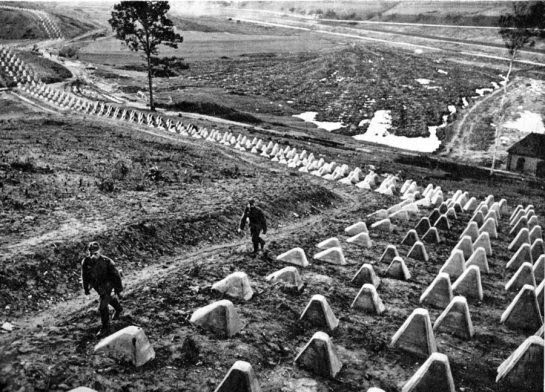 1938 established the German Labour Front [Deutsche Arbeitsfront] (DAF) in the vicinity of the village of Hinzert located in the Rhineland-Palatinate, (Hunsrück) a [barracks] camp for workers of the Western Wall, the so-called Siegfried Line, 30 km from the Luxembourg border. During 1939 the camp was taken over by the Organisation Todt (OT). It was now used as a 'training camp' for detained individuals by the police, referred to as 'special camp'(SS-Sonderlager). On 1 July 1940, Hinzert was subordinate to the inspector of concentration camps and through this process assigned the status as a main concentration camp, however, it was not until February 1942, that the Group D of the SS Economic-Administrative Main Office controlled these facilities. Hinzert served first as a 'work camp' (Arbeitserziehungslager) for Western Wall workers and became the centre of the completed 'West camp', in fact a police detention camp, and were initially reporting to the Inspector of the Security Police and the SD. From November 1944 onwards Hinzert was subject to the control of the the Buchenwald concentration camp, until the evacuation of the last prisoners, which took place in March. In addition to labour education prisoners (work-shy), as well as political people held in 'protective custody', especially resistance fighters from Luxembourg and France, but also Italians, Poles, German Foreign Legionnaires, when they returned to Germany, [it was outlawed under the NS-regime to join the French Foreign Legion] and members of other groups of undesirable persons were kept here. 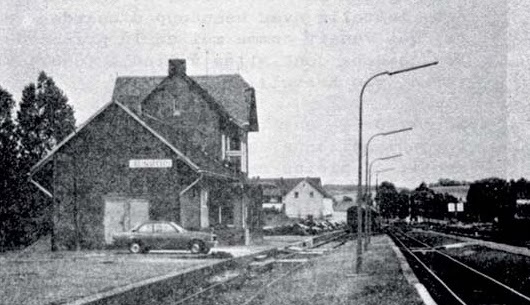 For many, Hinzert was a transit station on the way to other camps. As an SS special concentration camp (SS-Sonderlager/KZ) Hinzert comprised of a total of 29 satellite camps in the Rhine-Main area, in the Eifel and Saarland. They had partly the function of 'labour education camps' or police detention centres. Some were kept for the Organisation Todt as a working reservoir, others were built at sites of the arms industry or established and made available on airfields and other military installations of the Wehrmacht. Often the prisoners were used to remove air-raid war damages. About the majority of the satellite camps of Hinzert, there is only scant information. 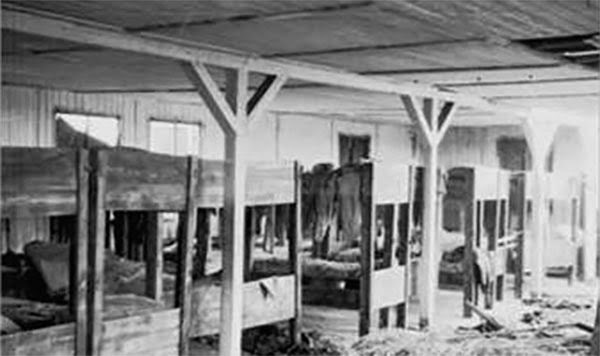 The longest existing satellite camp was in Wittenberg at the Phrix works where the prisoners were used in the production of cellulose. Because the company's management was not satisfied with the condition of the workers, they were sent back to the main camp, (Return Transfer) not out of care for them, but from considerations of less further utility and of no practical use, they demanded healthier prisoners as a substitute, on the grounds that there was no purpose for starved labour, the prisoners returned in February 1945. Thus, the factory management got rid of a burden, considering the given war's end-threatening conditions. A special case is the camp Wöbbelin that was ten weeks at the turn of 1944/45 built as an evacuation and death camp for 5,000 prisoners and became for many the last station for them. About 1,000 people died there. Quite late, only in April 1945, a POW camp at Sandbostel had been established as a concentration camp, where about 10,000 prisoners languished. 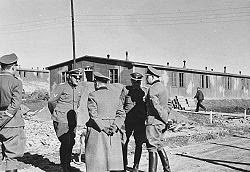 The camp was designated in the Nazi era as 'SS-Hinzert special camp' (SS-Sonderlager Hinzert), and in it's early days run as a 'police custody camp Hinzert'[which was compulsory labour, by people kept in jails]. This is explained by the history of the camp. The historical name after 1945 led to repeatedly denying the character of a concentration camp and German officialdom only conceded its existence from the beginning as a functioning 'work camp'. Until into the 90s the claim was made to call the camp what it actually was, had been ignored by the German authorities. The pertinent efforts of former deportees, especially from Luxembourg, or of persons who had dealt with the history of the camp were blocked. However, the camp Hinzert was far more, and a special part of the concentration camp system during the Second World War. In the fall of 1939, the 'Security Offices' the competent authorities responsible for the Westwallbau superstructure responsible for delinquent workers, built more 'police detention camps', in which the inmates should not only be 're-educated', but were also collected and used on special work details. These camp structures were built at location at Vicht south of Aachen, in Uthlede at Wesermünde in Hamburg-West, in Mörsch in Frankenthal, in Reinzabern near Germersheim and Hinzert. 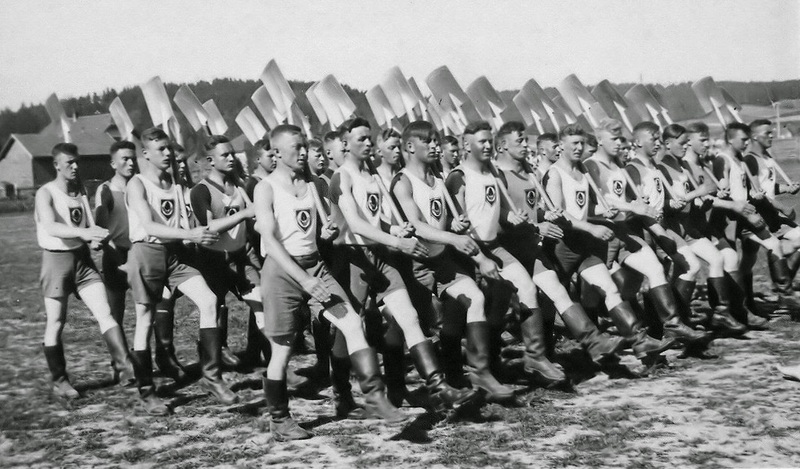 All these camps were reporting and controlled by the camp commandant of the 'SS special camp Hinzert' (SS-Sonderlager') and thus assumed a national function from the beginning. These Polizrihaftlager should and would implement the 'Local Emergency Arresting Law' whereby to relieve overcrowded prisons and ensure that the prisoners were not lost for use in the labour process requirement, but were brought to heel by tighter labour laws in line with Nazi ideology. Looking at the background of their commercial use, the promotion of the Westwall building by allocating previously disciplined workers in the Nazi sense to build at the 'Superstructure Westwall'. These camps were also called 'the West Camps' in official communications. 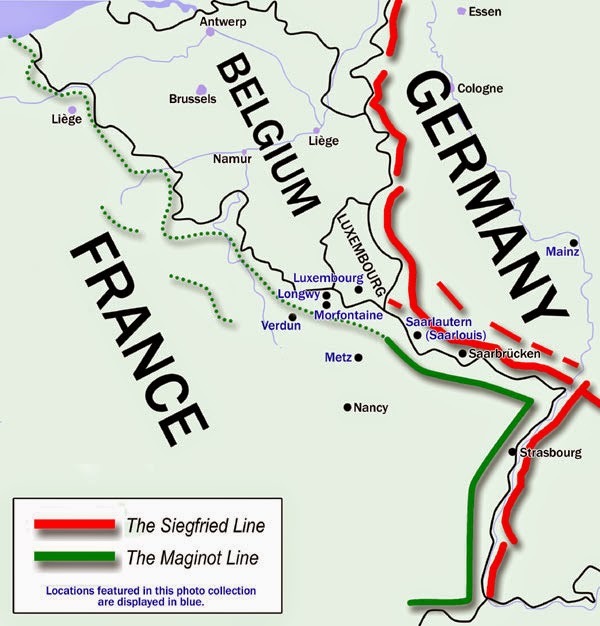 The Westwall (Siefried Line) and the Maginot Line' The Americans never conquered the Westwall! In addition to the 'labour education prisoners' increasingly political prisoners were now brought to Hinzert, especially members of the Resistance from neighbouring Luxembourg, which after the German invasion on the 10th May 1940, the Gauleiter of Koblenz-Trier, Gustav Simon, was appointed on the 2nd of August as head of the civil administration of Luxembourg. Simon incorporated the conquered state of Luxembourg into his Gau 'Moselland'. The first protective custody admission of political prisoners was taken by Luxembourg, and commenced from the summer of 1941. On August 30th 1942, Gustav Simon publicly announced the introduction of compulsory military service. Having had wind of this ordinance, the resistance fighters decided to call a general strike. In order to inform the population that nobody was to go to work or school on August 31st 1942, fliers were printed and distributed. The strike commenced in Wiltz in the morning and, from there, spread through the entire country. The Germans retorted savagely, arresting those alleged to have been responsible and sentencing them to death by courtmartial (‘Standgericht’). Consequently, twenty people were shot in September 1942 at the concentration camp Hinzert. When military service became mandatory, a good many young men fled the country, be it to enlist with the allied forces or join the French and Belgian resistance movements. Others completed their training but did not return from their home leave. If, for some reason or other, they could not or would not go abroad, they went into hiding aided by resistance fighters or common citizens. For this purpose, a large number of special hideaways were created, with utmost secrecy, in forests, mines, churches and on farms. About two thirds of the objectors made use of this arrangement, which came at a prize: Discovery could mean death for both the young men and their helpers, as well as the dreaded deportation to the eastern border of the Reich (‘Ëmsiedlung’). Nonetheless, a total of 3,500 out of the 10,200 young men that had been summoned managed to circumvent recruitment. 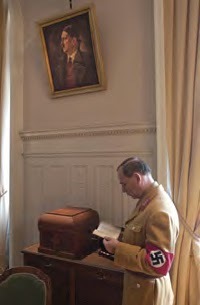 Oswald Pohl and Richard Glücks could show at the foundation of the SS-WVHA from available statistics of the IKL, to convey to the Reichsführer SS Heinrich Himmler that the RSHA, had not run the camp Hinzert economically effectively until 1942. Himmler declared on 7 February 1942 at a meeting at Hitler's headquarters 'Wolsschanse': "I believe that we can not afford at the present time that the SS special camp 'Hinzert', which currently is under the Reich Main Security Office shall continue in its present form, because as I have noted, there is nothing rational done or what is performed there is not vital for winning the war. Anyway In the winter virtually nothing is ever finished. I reckon it as important that the Hinzert concentration camp on an economically basis should be incorporated into the Inspectorate of Concentration Camps ". After subordination of the camp personnel under the IKL as well as the economically responsibility by the IKL, which in turn was just incorporated as an official group D into the formation of the SS-WVHA, it became clear this meant that the prisoners of the SS Sonderlager of the IKL, respectively, became now under the new SS-WVHA. Up to and until February 1942, only the RSHA Department II had been responsible over the Gestapo-Section Trier's activities. With the intention of SS-WVHA, rigorous use of the concentration camp prisoners as manpower for the war economy would be demanded, and the degree of exploitation of labour of the prisoners in the SS special camp changed up to the 'extermination through hard labour' (Vernichtung durch Arbeit). Oswald Pohl had succeeded in being awarded the responsibility for the special camp in Hinzert. At the same time he received the budgetary control over the Gestapo-Section Trier and the RSHA Department II for the maintenance and infrastructure for barracks construction and supply of goods plus the amount of lease-hold payments to their original owners. That was a very cost effective solution for him by his newly founded SS-WVHA. The SS special camp, therefore, was in the truest sense of the word a special form of a concentration camp. 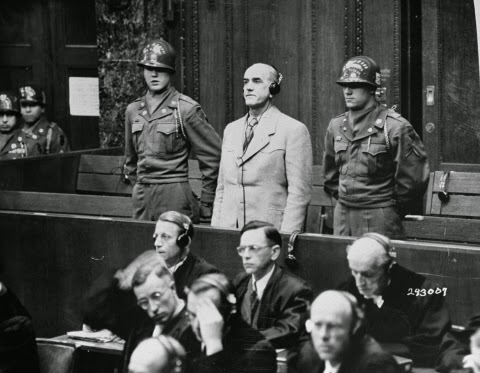 Defendant Oswald Pohl, a former SS Obergruppenfuehrer and general in the Waffen-SS, is sentenced to death by hanging at the Military Tribunal II at the Pohl/WVHA trial. After the outbreak of war, camp inmates were increasingly deployed in armaments production and mercilessly exploited in the process.This necessitates measures to ensure the gradual transformation of the concentration camps from their previously one-sided political form into organizations more suitable for economic tasks. With the integration of prisoners into wartime production, the camps assumed far greater economic importance than ever before. On March 3, 1942, the camps were placed under the control of the SS Economic and Administrative Main Office [SS-Wirtschafts- und Verwaltungshauptamt or WVHA], which was led by SS-Obergruppenführer Oswald Pohl. His report of April 30, 1942, already announces the shift from a penal- to work-camp structure, a move that introduced certain improvements in camp conditions, at least on a short-term basis, since prisoners were now regarded as an important labour source in the war effort. On the whole, however, the massive, long-term deployment of forced labourers from the camps also entailed the ruthless exploitation of human life. The first admissions to the camp in 1939 was made to discipline workers of the Organisation Todt. The men who had refused to work were designated 'wards' (Zöglinge) and were held for a period of 21 days in a police custody section or for 56 days in the labour camp. After their release, they had no criminal record in a legal sense, but were considered 'difficult-unworthy'(wehrwürdig). With the outbreak of war this position changed somewhat as people were taken into Hinzert and were abused there, to punish them because of their political beliefs or their religious convictions. During the year 1941, the classification of prisoners was adjusted with the term 'ward', as a category abolished and replaced wit he the term of 'Protective Custody' and 'Work Education Prisoners'(Arbeitserziehungshäftlinge) were now only used. The first major consignments of protection prisoners took place in the summer of 1941 from the Grand Duchy Luxembourg. Henceforth Hinzert was the central prison facility for Luxembourg opponents of the German occupation forces and members of the Luxembourger Resistance. Many were deported from here to other places of detention and concentration camps. During the second world war, political prisoners were deported from countries occupied by the Wehrmacht into the SS special camp/concentration camp Hinzert. Three times prisoners were taken only to Hinzert in order to be liquidated there in groups: (1941- 70 Soviets, 1942- 20 and 1944- 23 Luxembourger victims). 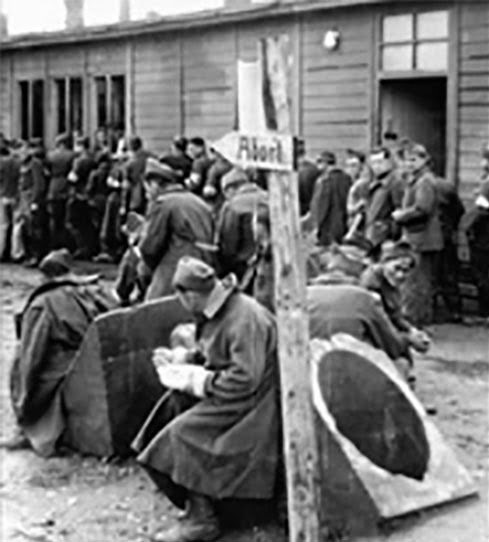 Most of the prisoners who were not released, but deported either after a term in a Hinzert sub--camp of the KZ or to other concentration camps. Commandant Hermann Pister oversees a column of prisoners. if she was 'nordic' and if approved even received a Govt. Monetary Grant (Ehestandsdarlehn) quite openly to establish families. Priest, painter draughtsman and engraver, the Frenchman John Daligault a member of the Resistance in 1940, through the Volunteer Army Caen branch network, arrested on 31 August 1941 he was detained in Fresnes, tried, and then transferred to Germany, into the prison of Trier (Rhineland-Palatinate). He was then interned in the nearby concentration camp Hinzert from 1942 to March 1943. After several months in captivity in prisons and other camps, he was executed in Dachau, April 28, 1945.